The fairy tale Little Red Riding Hood has origins as far back as the 17th century and was first published by the brothers Grimm in 1812. Thornbury Musical Theatre Group is bringing this traditional family pantomime to you, bang up-to-date and with a few new twists and turns along the route to Grandmother’s house. The pantomime has loads of the traditional elements of family entertainment including; slap-stick, mess and goo, the outlandish Dame and a large helping of audience participation. It is full of fun and jokes for everyone, with the music including songs from One Direction, Black Eyed Peas, Judy Garland and the Muppets. TMTG has assembled an experienced and talented cast and its recent pantos Babes in the Wood and Cinderella have either been nominated for or won Rose Bowl awards. So do make sure you come along and enjoy the fun! There are some surprises in store for Little Red Riding Hood as she travels through the forest from her home in the town of Colourtopia. She meets up with a number of other delightful fairy tale characters that you’ll all know and love. However, the evil Queen Monochrome has other plans for Red Riding Hood. With her trusty wolf, Baines Blood by her side, she sets out to make the visit to Grandmother’s house just a little tricky! Will evil succeed, or will Little Red Riding Hood helped by her friends, a handsome Prince, Fairy Rainbow, her hapless brother Little Boy Blue and her eccentric mother Dame Marigold win the day? Your can listen to Lizzie Lindsell talking live on Ujima Radio 98FM when she was interviewed by presenter Paulette on her Outlook programme on 31st January. Lizzie does a great job talking over a 30minute period about our panto Little Red Riding Hood, TMTG in general and even Margate! To listen to it just follow this link http://listen-again.ujimaradio.com/index.php? id=7142 click on the sled bar and drag it to 17minutes to hear the start. Auditions are over and a talented cast has been named for this traditional and entertaining family panto. To see the cast details and a synopsis for the show, hit the “Productions” button above. Our pantomimes have a great reputation, with both a Rose Bowl Award and a nomination in the last 3 years. As with Beauty and the Beast, we expect tickets will go very quickly for certain performances. So to avoid disappointment, please don’t delay by hitting the "Get Tickets" button above, where you will find information on pricing, discounts and how to place orders. 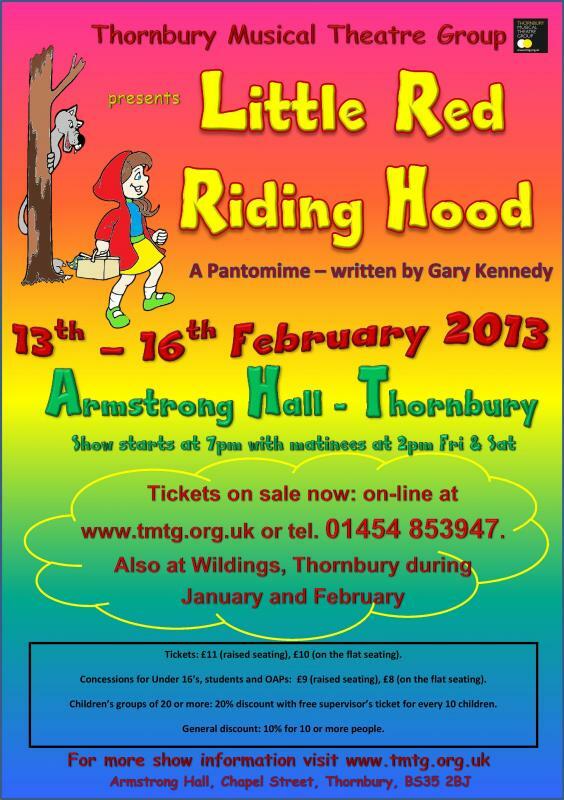 The 2013 production “Little Red Riding Hood”, written and directed by our own Gary Kennedy, has been nominated for the June Barker Memorial Cup for “Best Pantomime”. This is three years running that our pantos have been nominated for such awards, with Cinderella winning a Rose Bowl in 2012.